The month of December was a time to reflect on all of the great efforts Vets4Warriors has accomplished over the past year and to celebrate six years of devoted service and support! 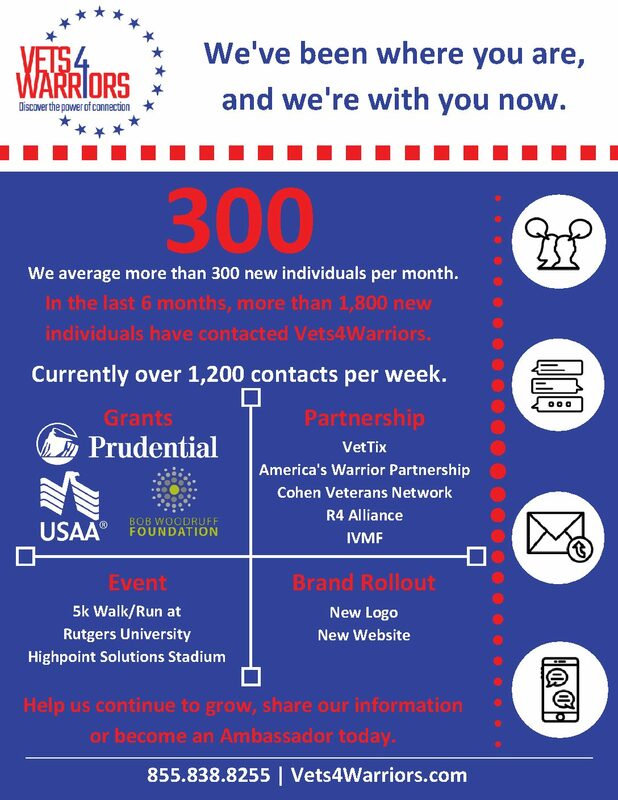 As we continue to grow, we want to give a special thank you to all of those who support us, who contact us and who share our information with others – Your continued commitment allows Vets4Warriors to provide 24/7 peer support to the veteran and military community. Throughout 2017, we have averaged more than 1,200 contacts per week. In the last six months, we have had more than 1,800 new individuals that have contacted Vets4Warriors, which means over 300 new individuals per month. We’ve gained a number of incredible partnerships over the past year to include Cohen Veterans Network, Veteran Tickets Foundation (Vet Tix), America’s Warrior Partnership and IVMF. Also, a special thanks to Organic Communications who assisted us with our new brand rollout and new website, which is allowing us to provide a clearer message and reach more veterans and families in need of our services. December also marked Vets4Warriors’ six-year anniversary! We are grateful for the support of our sponsors, donors and supporters that allow us to continue to grow and provide our services to those in need of them. Please share our information with others or consider becoming an ambassador so we can continue to provide our services to the veteran and military community. At Vets4Warriors, our peer staff members are able to connect with other veterans, service members in the U.S. and overseas, family members or caregivers who need to talk to an individual who can properly assist them. To learn more about Vets4Warriors, please visit the Vets4Warriors website or call 855-838-8255.